Save the Monkeys! Help them build towers and avoid the dangers along the way. Construction! Destruction! MONKEYS! Tiki Towers is a game of construction, destruction, problem solving, and monkeys! Reclaim the islands of your tribe by defeating a series of evil enemy chiefs. Work with your monkey friends to build towers out of bamboo poles, coconuts, and vines. 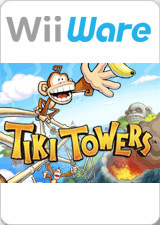 Match wits against the enemy chiefs bent on destroying your towers and driving you from the islands. Navigate levels filled with crazy building challenges, and deal with unfriendly wildlife and other environmental obstacles. Get your monkeys to chant for the BananaMana necessary to counter enemy attacks. Play in either single-player or two-player cooperative mode in this game where monkeys rule! The graph below charts the compatibility with Tiki Towers since Dolphin's 2.0 release, listing revisions only where a compatibility change occurred. This page was last edited on 23 January 2018, at 10:56.